Stroll the streets of this famous neighborhood and view the stately mansions and lush gardens. Upon arrival in New Orleans after the Louisiana Purchase in 1803, the Americans found the Creoles living down-river from Canal Street. The two groups hated each other, so the Americans settled up-river from Canal Street in the early and mid-nineteenth century. This enclave of Americans became filthy rich and built great, ostentatious mansions in an area that came to be known as the Garden District. On the Garden District tour, you will see the homes of Archie Manning, John Goodman, and the house where the Confederate President, Jefferson Davis, died. You will visit Lafayette Cemetery. Our licensed guides will entertain and educate you on the local unusual customs of burial and interment. Tours are offered at 10:00 am and 1:00 pm daily, from the Still Perkin Coffee Shop at 2727 Prytania, and last for about two hours. Please arrive 15 minutes early for check-in. 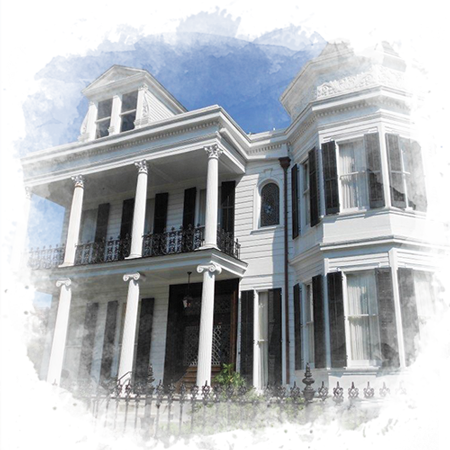 Be amazed by the Garden District homes, which exhibit features of several architectural styles. Included are the Italiante, Queen Anne, Greek Revival, the Italianate, and the Louisiana Raised Cottage. Enjoy the huge trees, beautiful flowers, and the lush foliage. Most houses are very elaborate, reflecting the desire to demonstrate the wealth of the owner. Houses were constantly remodeled to “keep up with the Jones”. As a result, homes were updated to surpass the grandiosity of the last that was remodeled. Visit Lafayette Cemetery, where you will see the famous above the ground tombs and “Wall Vaults”. The wall vaults were called ovens because temperatures in the summer rose to several hundred degrees inside, thereby facilitating the rapid decomposition of the body.